• Around 70 percent of homes sold at or above asking price. Although the speed of the market was near record levels, average prices for ASF and DSF were below projections. One month does not make a trend, but with the market in 2018 going higher and faster than previous years, it may also be slowing down sooner as inventory continues to rise and buyer activity tapers off. 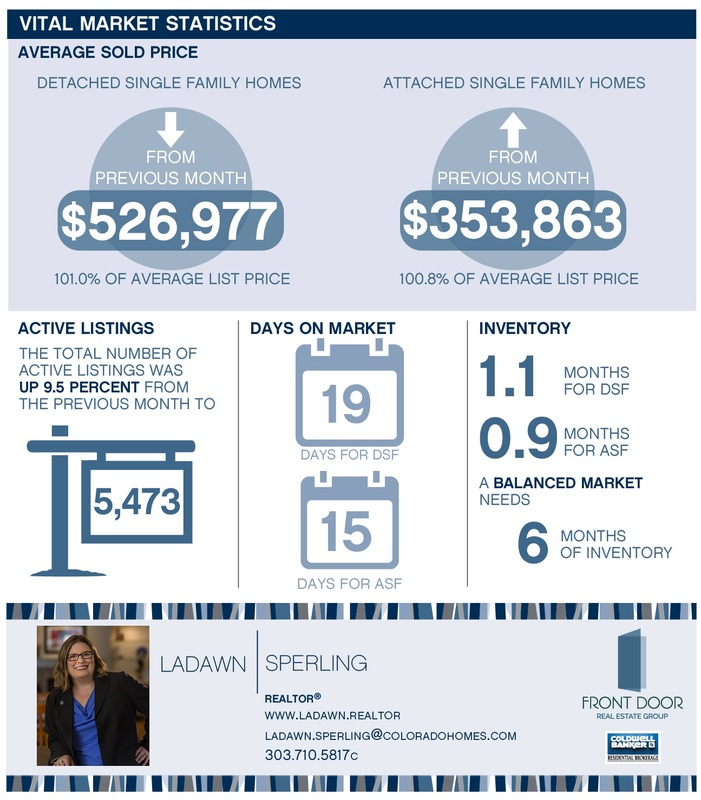 If you need any advice or assistance navigating our real estate market, contact me today at 303.710.5817 or ladawn.sperling@coloradohomes. com. I am never too busy for your referrals. This update is based on information from REColorado®, Inc. provided by Land Title for the period of May 1, 2018, through May 31, 2018, for Adams, Arapahoe, Broomfield, Denver, Douglas, Elbert and Jefferson Counties. Note: This representation is based in whole or in part on content supplied by REColorado®, Inc. REColorado®, Inc. does not guarantee nor is in any way responsible for its accuracy. Content maintained by REColorado®, Inc. may not reflect all real estate activity in the market.